Is it difficult for you to speak to a group of people? Getting in front of a group of people can be nerve racking. Sweaty palms, shaky knees and a unsteady voice are the main signs. We have all been there at one point in time, thoughts running through your head of what people are thinking and if they can even tell how nervous you truly are. 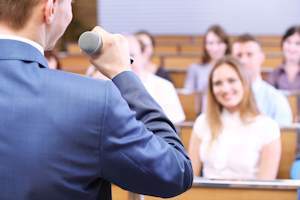 Speech classes are available at most colleges and universities to improve the quality of your public speaking skills. Even though I myself have found it to be effective for overcoming these natural fight or flight reactions, it can be time consuming as well as pricey. Program your mind to become more in control by listening to Threshold Subliminal audio technology. Do you feel as if you are being judged when speaking to a group of people? Does your nervousness affect the message you are trying to share with others? Is it taking away from the connection you would like to have with your audience? Is mastering this skill the only thing keeping you away from being promoted at work? If you answered yes to any of the questions above, you are one step closer to mastering the skill of public speaking. Becoming in control of your trailing thoughts and jitters during a presentation is key. Start living! Stop letting your doubts get in the way of happiness and success!